I finished my socks tonight too!! These are the second for the year - part of my 'super special 6 pattern sock club' on ravelry. 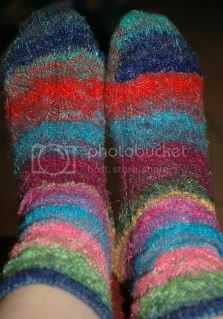 Loving how the Noro knitted up!!! Finishing these is not only exciting because i finished well ahead of month end, but also because i get to start on a cute little purple newborn dress :D My first knit for this bubba. Got about 10 rows done tonight. I'll get a bit more done tomorrow in the car as we are heading up to Redcliff to stay with Leah for easter and my birthday!! Nadine and Brian are up there already, so we'll be joining them for a lovely friends catch-up weekend.